Just look at this thing. Take your eyes, and look at it. Because it is marvelous. 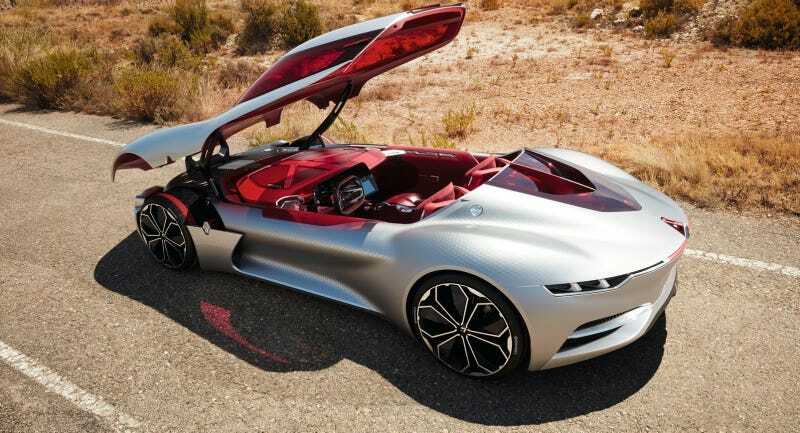 This is like if Renault took an alien that could somehow open up its head and made it into a car. I’m so okay with it. There are luggage compartments in the front! When the car is in autonomous mode, the exterior lighting signature changes and extends to the lateral and rear logos, to indicate to other road users that driving has been delegated. With the wheel in this configuration, the driver also has a panoramic view of the dashboard. In this mode, the Trezor allows occupants to use their time on a journey to stay connected. The driver and passenger are able to immerse themselves in a shared universe, perhaps by watching a film, playing a game or flicking through photographs. This sets off my trypophobia a little bit. That’s pretty cool, I suppose. But, really, none of those details matter in the slightest because this is just a concept. I think the main focus here is the looks of the thing. And the weirdly sexual spin Renault put on it. Annoyingly, the press release mentions the word “sensual” six times. Renault prattles on about how the concept embodies “falling in love” and explicitly points out the “Passion Red coachwork” of the interior. Damn, I thought when I read that. When you put it that way, it makes the inside look and sound like one of those couple’s motels that have the themed rooms. You know, those motels that also offer hourly rates. Fine, whatever. You can bet that if I ever get to sit in this thing, I’ll be making whooshing noises with my mouth whenever the top goes up or down. Here’s a photo of a dude hanging out with the car in a random desert.